This article is about the ruler of Tenochtitlan. For other uses, see Cuitláhuac (disambiguation). Cuitláhuac in the Primeros Memoriales. Cuitláhuac (Spanish pronunciation: [kwiˈtɬawak]) (c. 1476 – 1520) or Cuitláhuac (in Spanish orthography; Nahuatl: Cuitlāhuac, Nahuatl pronunciation: [kʷiˈt͡ɬaːwak], honorific form Cuitlahuatzin) was the 10th tlatoani (ruler) of the Aztec city of Tenochtitlan for 80 days during the year Two Flint (1520). Cuitláhuac was the eleventh son of the ruler Axayacatl and a younger brother of Moctezuma II, the previous ruler of Tenochtitlan. 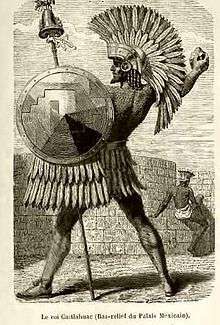 His mother's father, also called Cuitlahuac, had been ruler of Iztapalapa, and the younger Cuitláhuac also ruled there initially. Cuitláhuac was made tlatoani of Tenochtitlan during the Spanish conquest of Mexico; After Pedro de Alvarado had ordered the Massacre in the Great Temple, the Aztecs were very upset and started to fight and put a siege to the Spaniards. Hernán Cortés ordered Moctezuma to ask his people to stop fighting. Moctezuma told him that they would not listen to him and suggested Cortés free Cuitláhuac so that he could convince them to dispose of their arms and not fight anymore. Cortés then freed Cuitláhuac and once Cuitláhuac was free he led his people against the conquistadors. He succeeded and the Spaniards were driven out of Tenochtitlan on June 30, 1520. Cuitláhuac was ritually married to Moctezuma's eldest daughter, a ten- or eleven-year-old girl who later was called Isabel Moctezuma. After having ruled for just 80 days, Cuitláhuac died of smallpox that had been introduced to the New World by the Europeans. His elder brother Matlatzincatzin, who had been cihuacoatl ("president"), resigned upon Cuitláhuac's death. As soon as Cuitláhuac died, Cuauhtémoc was made the next tlatoani. The modern Mexican municipality of Cuitláhuac, Veracruz and the Mexico City Metro station Metro Cuitláhuac are named in honor of Cuitláhuac. The asteroid 2275 Cuitláhuac is also named after this ruler. There is an Avenue in Mexico City Called Cuitláhuac (Eje 3 Norte) that runs from Avenue Insurgentes to Avenue Mexico-Tacuba and that is part of an inner ring; also many streets in other towns and villages in Mexico are so called. ↑ For year of birth, see entry for "CUITLAHUAC", Dictionnaire de la langue nahuatl classique (Wimmer 2006). 1 2 3 Chimalpahin (1997): pp. 56–57, 164–165, 216–217. ↑ Chimalpahin (1997): pp. 148–151. ↑ Chimalpahin (1997): pp. 42–43. ↑ Chimalpahin (1997): pp. 50–51. ↑ Probably from Chimalpahin (1997); broken reference. Wikimedia Commons has media related to Cuitláhuac.